With growing unease about the efficacy of quantitative easing (QE) policies, capital markets are at an important juncture. In this webinar we discuss current market conditions and the outlook for global listed property. Low interest rates, low inflation, low growth and a multitude of geo-political challenges is now the well established state of affairs. How has listed real estate ‎positioned itself in this environment? During our 20 minute webinar, Rob Promisel (Global Portfolio Manager) will provide a recap of Fund performance over the December quarter and discuss the key technology trends impacting real estate. Technology is causing disruption for real estate e.g virtual supply (Airbnb creating sleepless nights for hotel owner/operators and Etail replacing shopping malls), work place changes, sustainability requirements. The risk of building obsolescence is now higher and listed REITs, given their scale are better placed to deal with these challenges versus many private operators. Looking through recent market volatility, REIT earnings growth remains well above inflation and REITS are trading at a material discount to direct property. REIT management teams are using this backdrop to sell mature assets, manage leverage to sensible levels and re-invest into value-add development. The prospect of further M&A activity remains high. 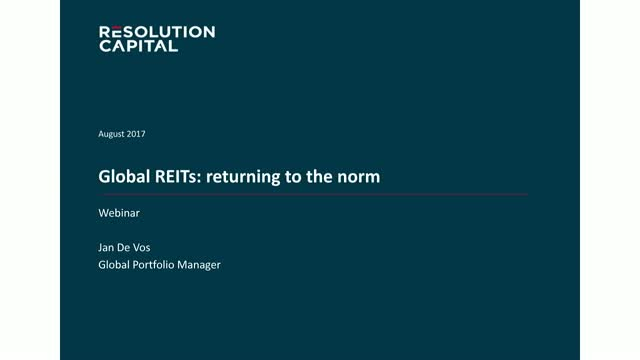 This webinar will talk through the risks and opportunities for REIT earnings growth. Earnings season is underway and has seen a very strong Q2 reporting season for the holdings in the Resolution Capital Global Property Securities Fund. The REITs are enjoying record levels of occupancy and income growth, against a still muted supply outlook. The U.S. apartment sector has been a notable performer given the favourable demographic changes in key U.S. Coastal locations. Transaction activity remains high and capital flows into direct real estate remain robust, which is also supporting underlying asset values. Andrew Parsons will discuss the global listed property market and the M&A activity occurring. Andrew Parsons will provide an update on the global REIT market, including key investment trends and the outlook for 2015. Andrew Parsons, Managing Director and Global Portfolio Manager of Resolution Capital will provide an update of the global REIT markets and trends that impacted it over the June quarter. An overview of key events and trends shaping the global listed real estate markets. A review of the global REIT markets over the December quarter - key trends and forecasts. September Quarter Update on the Global REIT sector. Marco Colantonio, a Global Portfolio Manager with Resolution Capital will present on the key investment trends impacting the GREIT sector over the June 2013 quarter. Andrew Parsons, MD and Global Portfolio Manager of Resolution Capital will provide a market update and present on key trends in the GREIT sector for the December 2012 quarter. Andrew Parsons provides an update on the Global REIT market detailing how and why certain GREITs have performed as they have and what is the outlook for Global REITs. Resolution Capital will provide updates to financial intermediaries on the Global and Australian REIT market.